This Lease (“Lease”) is made as of _________________, by and between COMMERCIAL PROPERTY LANDLORD, INC., a __________________ corporation (“Landlord”), and QUICK FOOD RESTAURANT, a _________________ corporation (“Tenant”). References below to the "Basic Lease Information" are references to the information set out above. If a conflict exists between the Basic Lease Information and the provisions below, the provisions below will control. Landlord hereby leases to Tenant and Tenant hereby leases from Landlord certain premises (the "Food Court Premises") in the Shopping Center for the term, at the rental, and upon all the conditions and agreements set forth herein. The location of the Food Court Premises within the Shopping Center is shown cross-hatched on the site plan attached hereto as Exhibit A, but if there shall exist any discrepancy between the location shown on Exhibit A and the location of the actual demising walls of the Food Court Premises (as such walls presently exist or as they are hereafter constructed under Landlord's supervision and with Landlord's approval) the location of the demising walls shall control. Notwithstanding anything to the contrary contained herein, the term "Shopping Center" as used in this Lease does not include anything outside the boundaries of the land described in Exhibit A-1 attached hereto, it being understood that the site plan attached hereto as Exhibit A may depict more than the Shopping Center. The Food Court Premises contain approximately the number of square feet of floor area that is specified in the Basic Lease Information and are located on the floor level(s) specified in the Basic Lease Information. The Food Court Premises shall not include and Tenant shall not be entitled to use the land lying thereunder or any part of the exterior walls of the buildings in which the Food Court Premises are located or the roof thereof or any space other than on the floor level(s) indicated in the preceding sentence. The term of this Lease shall commence on the date (the "Commencement Date") that is the earlier of (i) the Scheduled Commencement Date specified in the Basic Lease Information, (ii) the date specified in Exhibit B attached hereto, if any, as the latest possible Commencement Date, and (iii) the date on which Tenant opens for business in the Food Court Premises; and the term of this Lease shall expire on the expiration date specified in the Basic Lease Information (the "Expiration Date"). Such term is hereinafter referred to as the "Lease Term" or the "term of this Lease". After the Commencement Date has been determined and Tenant has accepted possession of the Food Court Premises, Tenant shall sign and deliver a certificate upon request of Landlord in the form attached hereto as Exhibit C.
Seating. 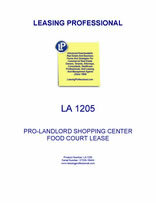 Throughout the Lease Term, Landlord shall provide a seating area in the Food Court for customers purchasing items from all restaurants in the Food Court, it being agreed that Landlord shall use commercially reasonable efforts to ensure a minimum of approximately 6 seats per 100 square feet of leasable Food Court restaurant space. Tenant shall pay Landlord for each month in the Lease Term a guaranteed minimum monthly rental for the Food Court Premises ("Minimum Rent") as specified in the Basic Lease Information. Such Minimum Rent will be due in advance beginning on the Commencement Date and continuing on the first day of each calendar month thereafter. It will be prorated on a daily basis for the first month if the Commencement Date is not on the first day of a calendar month and for the last month if the Expiration Date is not on the last day of a calendar month. Minimum Rent shall be payable without demand, deduction or offset, at the address for Landlord set forth in the Basic Lease Information, or at such other place as Landlord may from time to time designate in writing.